Stephen Kitras uses his own artistry to bring some of van Gogh's magic to life in your own garden. Vincent van Gogh"s masterpiece Starry Night offers a breathtaking glimpse of the mysterious wonder in a starlit sky. Glassblower Stephen Kitras uses his own artistry to bring some of van Gogh's magic to life in your own garden. He draws upon the painting's nocturnal palette, and captures the swirling of the paint in textured glass. Within is a solar-powered light that allows the ball's magic to continue to shine once evening falls. Use the included stake to display this glass masterpiece in your garden, along a pathway, or by your front door. Handmade in Canada. Stake: 28" H; Globe: 4" Dia. Clean glass and stand with a damp cloth - do not submerge in water. Can be left outside year round. To secure, hold the stake and push 4"-5" into the ground. Do not push on the glass globe. I love the unique products and super customer service! Although the lights stopped working near the end of the same year, UncommonGoods sent me 2 new replacements. I also found out that I can get the solar portion of the stake (including the battery) replaced for problems in the future. Much larger and nicer than expected. I received this as a gift, and it is beautiful - looks glorious at night! However, the first time I tried to put it in the ground, the plastic stake it sits on broke in two and was unusable. Uncommon Goods sent me a total replacement, which was great. So, be very careful with the plastic, as the lamp is unusable if it breaks - hopefully the manufacturer will upgrade the quality of the stakes. 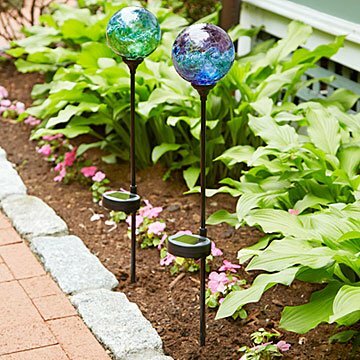 We love these solar garden lights... just perfect! Very attractive lights, visually enhanced our flower garden. My wife loves them., perfect gift for anyone who likes working in their yard. These were a very pretty addition to our backyard planting beds. Love how they light up at night! Considering getting some of the clear ones for the front of the house! The starry night is exquisite! It reflects beautifully on the side of my home! Love looking at it in the evening.